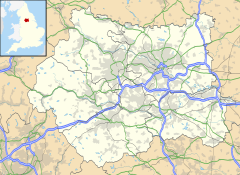 Bailiff Bridge is a village 1.5 miles (2.4 km) north from Brighouse, West Yorkshire, England, and is 5 miles (8.0 km) from Huddersfield and 7 miles (11 km) from Bradford. Bailiff Bridge falls within the Hipperholme and Lightcliffe Ward of Calderdale Council. The village is centred on the A649 and A641 roads which connect it to nearby towns and cities. The village was served by Bailiffe Bridge railway station on the Pickle Bridge Line between 1881 and 1917. The main employer in the village was Firth's carpets. Notable residents from the village are Danny and Richard McNamara from the band Embrace, who grew up in the village. ^ "Bailiff Bridge Beck". www.bailiff-bridge.co.uk. Retrieved 19 January 2016. ^ Burgess, Neil (2014). The lost railways of Yorkshire's West Riding: the central section - Bradford, Halifax, Huddersfield, Leeds, Wakefield. Catrine: Stenlake. p. 75. ISBN 9781840336573. Retrieved 19 January 2016. ^ Hirst, Andrew (18 November 2015). "Memories needed from people who worked at Firth's Carpets in Bailiff Bridge or lived in the village". huddersfieldexaminer. Retrieved 19 January 2016. ^ "Embrace – Songs, Playlists, Videos and Tours". BBC Music. BBC. Retrieved 19 January 2016. This West Yorkshire location article is a stub. You can help Wikipedia by expanding it. This page was last edited on 5 December 2018, at 08:25 (UTC).